This is a completely customized boxing boxer theme wedding cake topper ordered by one of our customers. My fiancé and I are 9 years in the making and are finally getting married on Oct 29, 2011 in St. Louis, MO. I am surprising him with a groom’s cake and since most of our cake budget is going into the actually wedding cake, I wanted to do something really special for him. I am just having a sheet cake made to look like two boxing gloves and on one glove it would read. “He may have won this match…” And the other glove would read, “but I won his Heart!” And sitting up at the top of the cake would be the topper. He is an avid boxing fan! On his 30th birthday, I took him to the only major fight that has really been in St. Louis in the last decade, Zab Judah vs Corey Spinks. Other than that, he orders and/or watches all the popular fights on HBO and Showtime. I want to him to feel like the “Champ” on our wedding day. My idea was having us in a boxing ring with our wedding attire on, which I have pics of, and our hands up in victory with boxing gloves on his hands and in my free hand, my bouquet. In the middle of the ring, I would love to have the letter, “M” etched, like an advertising logo. Also, I was also thinking he could wear a boxing champion belt over his tux with the writing “#1 husband”. Then I was thinking of having the St. Louis Arch to go across the ring and have his name on one side our wedding date in the middle and my name on the other leg of the Arch. And on the back our last name McClendon. We also have three dogs that I would like to include in the topper. Even though, it is hard for him to admit, those puppies mean the world to him! We have two Shitzus and a Maltese mix. I was hoping to have our black and white shitzu sit either between us or just behind us and act like the ref. Then, on each side, in our corners, have the other two puppies sitting on a stool, like our coach or motivators. I think he would just die, if he saw this!! What an amazing idea! 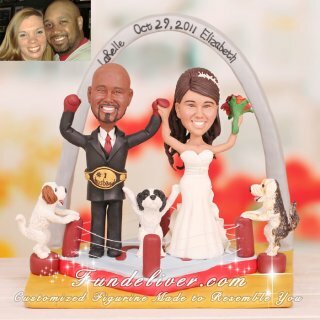 Thanks Elizabeth and LaRelle again for letting us sculpt this boxing wedding cake topper for them. 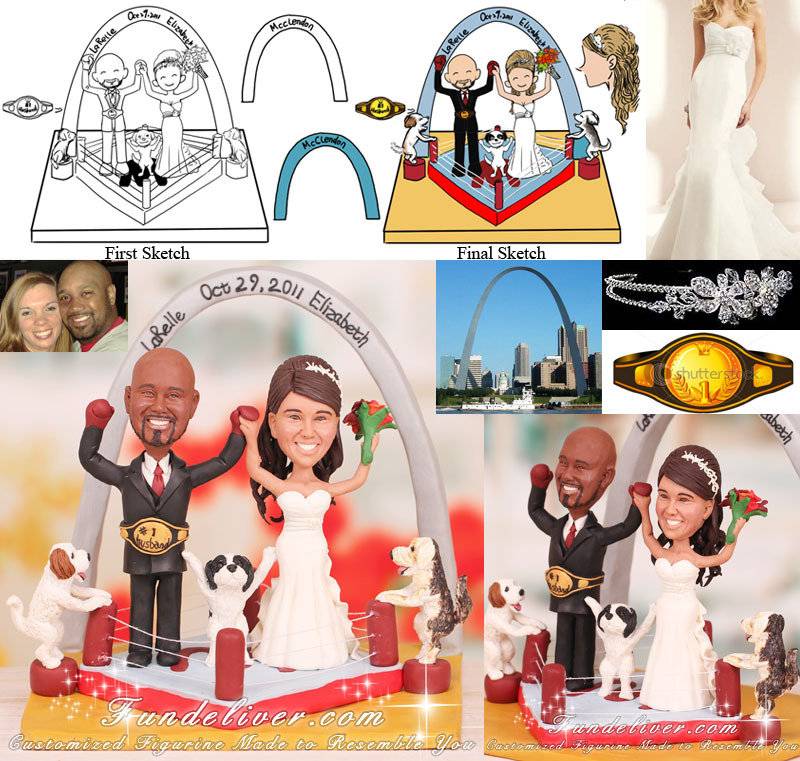 Want a similar design about your boxing theme cake topper or boxer cake topper? Just send us your idea and reference images, we will sculpt the just unique figurine to match your personality and theme.